Donald Sutherland (Outbreak), and Kate Nelligan (Up Close & Personal), ignite the screen as ill-fated lovers in this exciting emotionally involving thriller (New York Magazine). Based on the best-selling novel by Ken Follett, this searing mystery is a roller coaster ride of suspense, centering on the relationship between a master spy and a brave woman - with the fate of the world hangin in the balance. 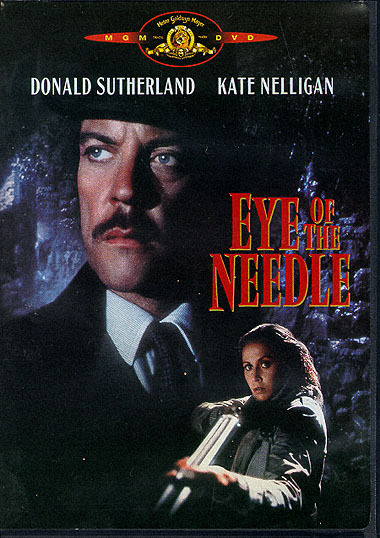 Englishmen know him as Faber, but to the Fatherland, he's the loyal and lethal spy known as "The Needle". On his way back to Germany, Faber is shipwrecked on an island outpost where he befriends Lucy, a beautiful Englishwoman who lives there with her family. Lonely and scorned by her bitter, crippled husband, Lucy falls for the enigmatic stranger, not knowing that he's a traitor determined to prevent the D-Day invasion. But as their passion erupts, Lucy discovers the brutal truth - as love and war melt into an electrifying climax of eroticism, adrenaline and terror!